When learning how to build your own chimney, knowledge will be your greatest ally. Fireplaces are a wonderful addition to any home. They provide warmth, a pleasant atmosphere, and are often a very inexpensive means of winter heating. They are not without their upkeep, however. Over the course of years, the elements can take their toll on your roof, and subsequently your chimney. Here are the codes, materials, and basic steps for either rebuilding or building a new chimney from scratch. The chimney will need a minimum of four inches space around the flue opening. Outside wall chimneys are usually only allowed to extend past the house wall one inch. Note: outside located chimneys do not draft (flow) as well as when they are built completely on the inside. Any wood siding used to cover the chimney must keep a minimum of two inches away from the brick. 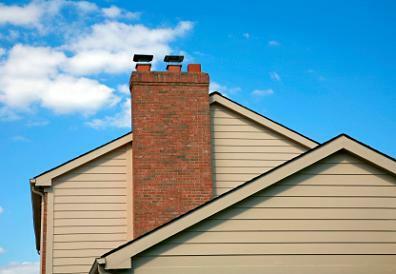 Most codes require the chimney to meet a minimum of three feet above the roof. If there are other areas of roof higher than the portion the chimney is located, the chimney will need to be built at least two feet taller than those other areas. Note: The taller the chimney, the better it will draft. Be aware some codes even restrict the color of your chimney. Prepare the mortar. You will know you have the right ratio of water to mortar if the mixture sticks to the trowel when held upside down, but slides off when banged against the side of the mixing bucket. Construct the firebox out of firebrick. Construct the hearth, which will be built around the firebox, and can have any choice of brick finish, barring any local code restrictions. Use plenty of mortar between the brick, packing it tightly between rows using a brick hammer. Fit the damper into the chimney, just above the hearth and fire brick. Fill any spaces around the damper with mortar. Once the damper is sealed, the upper portion of the chimney can be constructed in much the same way as the hearth. When you reach the top portion of the chimney, where it connects to the roof, lay down a tarp to protect roof shingles from damage. For more structural stability, reinforcement posts can be placed at all four corners of the chimney. Insulation can also be used between the brick and flue to help improve drafting. Once the flue is properly seated into the smoke chamber, continue to apply brick, making sure to keep it as perpendicular to the roof line as possible. Use a level to help guide you. Once you near the full length of your chimney, construct a sloping crown to help prevent the elements from making their way inside. You can also use a mesh screen/spark catcher to keep rodents out, although a cap will serve the same function. Portland cement is often used in place of mortar on the crown portion of the chimney, as it will withstand the elements better. Cover the top of the brick with chimney cap flashing. This is very important, as this is where most water damage and chimney deterioration occurs first. Fill the sides of the flue with the remaining mortar, pushing it into the crevasses with a trowel (or equivalent tool) until only approximately two-inches of the flue are visible. Add step flashing where the chimney meets the roof. This will keep water from finding its way into your home. In order to bend the flashing properly, you will need to identify the exact slope of your roof. Wear gloves while bending, as the sheet metal will be sharp. Attach the chimney cap to the flue in order to further discourage animals and the elements (rain, snow, etc.) from entering the chimney. Apply flashing along the edge of chimney, allowing several inches to lie flat on the roof. Nail the upper portion of the flashing to the chimney. Do not nail the flashing directly to the roof. Overlap flashing with shingles so that it will not be visible once the job is complete. Using a high heat, waterproof silicone caulk, seal underneath shingles and around all visible portions of flashing. Take care to make sure everything is sealed from the elements. It only takes a small amount of water leaked into the trusses to damage a roof, or minimize the effectiveness of attic insulation.